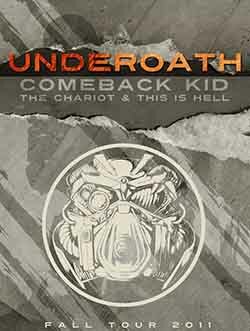 The American Christian metalcore band, Underoath, headlined a North American tour with The Chariot, Comeback Kid, and This is Hell in support of their fifth studio album, Ø (Disambiguation). The tour began September 15th in Fayetteville, Arkansas, and ended October 20th in St. Petersburg, Florida. 09/17 — Fort Collins, Colo.
09/20 — West Hollywood, Calif.
09/23 — Santa Clara, Calif.
10/20 — St. Petersburg, Fla.